A new scheme aimed at preventing stolen goods being sold by second-hand shops was launched in Preston at the start of April. The online CheckMEND service allows shops to search the National Mobile Property Register and other sources when purchasing items to find out if the item has been reported as lost or stolen. If this proves to be the case, the Police can then work to reunite the property with its’ rightful owner as well as taking the appropriate measures against whoever has tried to sell on lost or stolen property for their own financial gain. In addition, second-hand shops in the area also receive regular alerts about items that have been reported as lost or stolen from across the county via Lancashire Police’s In The Know messaging system. Shops taking part in the scheme can be identified by the distinctive posters on display in their windows proclaiming them as a Safe Seller. This scheme has been set up in conjunction with Preston City Council’s Licensing team, who along with the Lancashire Partnership Against Crime (LANPAC) has funded the purchase of transaction books to help shops when they are purchasing items. 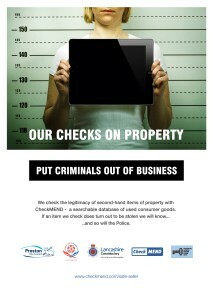 CheckMEND’s ‘Safe Seller’ scheme is established in other towns and cities nationwide, and has already had some success with several arrests being made and numerous items of property being recovered and returned to their owners, including a mobile phone which was stolen during a burglary in Scotland. The CheckMEND system has already been proved in other areas of the country, and really does help to ensure shops are not selling on stolen goods and putting money into the hands of criminals. Therefore, I would encourage Preston’s second-hand shops to sign up to the scheme, and our residents to vote with their feet and use the second-hand shops in Preston signed up to the Safe Seller scheme, so we can make Preston’s shops the most trusted in the area and ones which criminals cannot use to benefit from their illegal activities. This new CheckMEND scheme is a great way for people to buy with confidence and be reassured that the products they are buying are legitimate and not stolen. We would ask all traders in Preston that sell second hand goods to sign up to the scheme so that both they and their customers do not become victims of crime by unwittingly selling on stolen goods. CheckMEND is successfully run in other parts of the country and we are pleased that people in Preston are now able to buy goods more safely as a result of the scheme. CheckMEND is used by thousands of businesses throughout the UK, helping them avoid criminality and the costs associated with it. Recipero has always worked closely with police to address mobile phone crime and the CheckMEND Safe Seller Scheme is a key part of our commitment to tackle this ongoing issue.